This blouse dates from the end of World War I in 1918. 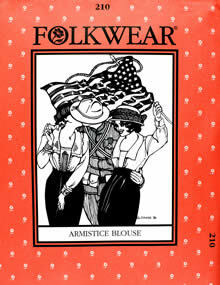 Fashion was in transition from frills to practicality, and this blouse blends the two beautifully. Make it as plain or fancy as you like. The center front panel can be lacy, pintucked, or plain; the collar and cuffs can be embellished in many ways. 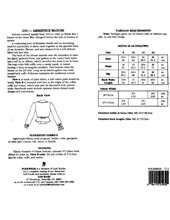 Pattern includes instructions for drawn-thread work. Misses 8-14.